The African Women’s Entrepreneurship Program (AWEP) is an outreach, education and engagement initiative that aims to empower African women entrepreneurs to become voices of change in their communities. Throughout Sub-Saharan Africa, talented and creative women are leading businesses, creating jobs and seizing economic opportunities. AWEP seeks to engage these women and equip them with the tools and opportunities to accelerate the growth of their businesses, become leaders in their communities and drive further social and economic progress in their communities. (3) Support advocacy for women’s economic empowerment (to become “voices of change”). During the two-week program, the 34 women were provided with an opportunity to meet and network with U.S. policy makers, companies and industry associations, U.S. and African civil society, non-profit organizations advocating for women’s economic opportunities, multi-lateral development organizations, and business alliances. These professional exchanges were designed to help the participants build business alliances, develop advocacy and communications skills, identify resources to advance women’s entrepreneurship, and take advantage of opportunities for U.S. partnerships through AGOA. • Inspire women toward greater utilization of AGOA with first-hand testimonials and dialogue with women who have succeeded under AGOA. The State Department is exploring bringing U.S. business women to various countries throughout Sub-Saharan Africa on trade missions, where they would attend market briefings, participate in site visits and networking receptions, and have one-on-one business matchmaking appointments with pre-screened potential buyers, agents, distributors, and joint venture partners. A women-focused entrepreneurial element is being considered for the State of Florida’s trade mission to Kenya and Rwanda slated for March 3-12, 2011. As part of continued outreach, State Department will continue to build the functionality and networking capacity of the AWEP Community Website. AWEP’s dynamic participants have taken the lessons learned from the program and turned them into successes across the continent. At the end of the two weeks, the 34 women were asked to write action plans detailing three to five items they would commit to doing upon return to their country. Less than six months later, many of these ambitious plans have already evolved into success stories. These anecdotes highlight the impact of the program and the opportunity for ongoing support and empowerment of African women entrepreneurs. Following the 2010 AWEP event at AGOA, the 34 AWEP participants signed a MOU creating a platform for women entrepreneurs from across sub-Saharan Africa. The Platform seeks to increase the participation of women entrepreneurs in the economy; play a role in good governance; develop co- operation and promote trade through partnership meetings and trade missions; and, develop a capacity-building program through training and transfer of technology and expertise. and the Sub-Saharan African region. Ms. Banda attributes her new success to the opportunities provided by AWEP and the AGOA Forum. Rugie Barry, the CEO of one of the largest construction supply companies in Liberia, was first introduced to the concept of an incubator at the 2010 AWEP event. Barely three months later, Rugie launched a business incubator for women on November 3, 2010. The incubator will receive initial funding from Ms. Barry personally, and will house up to a dozen start-up female entrepreneurs, providing them with office space, computer and office supplies, and business development services. The incubator will team with Liberia Enterprise Development Finance Corporation (LEDFC) and the Goldman Sachs 10,000 Women program to introduce the entrepreneurs to training opportunities, mentoring services and potential access to finance. Nigest Haile, Founder and Executive Director of Center for African Women Economic Empowerment (CAWEE) in Ethiopia is sharing information and best practices with other participants on the On Enat Bank. Enat Bank S.C is the first women’s bank in Ethiopia. Comfort Aku Adjahoe is Managing Direct-or of a shea butter production and export company in Ghana. The company is supplied by rural women cooperatives. During the AGOA event, Comfort shared with AWEP some of the challenges to her business, including a high percentage of spoilage and adverse conditions for the women cooperatives (e.g. snake and scorpion bites and harassment). 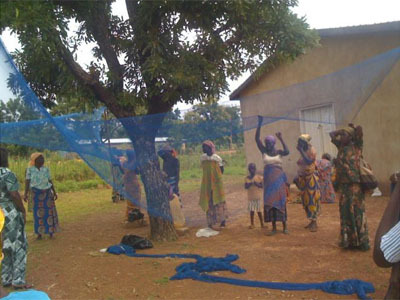 During the event, it was suggested to use nets to catch the nuts as they fell from the trees to mitigate challenges. After employing the new method, Comfort reported back great success, improved productivity and enthusiasm from the women who now spent less time harvesting. In March 2011, AWEP alumna Sylvia Banda launched the first AWEP national chapter in Lusaka, Zambia. Zambia will host the 2011 AGOA Forum in June. AWEP will host a three-day program alongside the 2011 AGOA Ministerial.